Hello!!!! I have a gorgeous polish to share with you today! My local grocery and drug store have been carrying the latest from LA Girl and I am loving it! 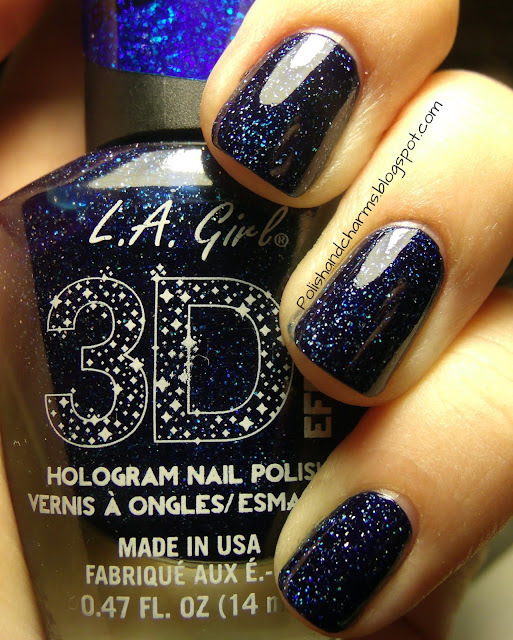 This is LA Girl 3D Effects in Brilliant Blue. It's supposed to be holographic, but it kind of gets lost. It's still gorgeous regardless! I layered this over China Glaze Up All Night. Enjoy! OH WOOOW - this is a stunner - I'm envious!! I love the finishes of these polishes...so pretty! VERY pretty! It kinda reminds me of Picture Polish Cosmos! I haven't seen that one, but this one is a keeper for sure! Wow this is definitely brilliant! It looks amazing! wow this is so glittery and beautiful!